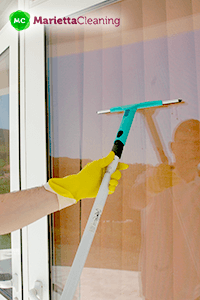 Regular window cleaning is one of the key property maintenance tasks that really improve the exterior look of your house. With time, dirt and dust forms a smeared layer over the glass surface that not only decreases the appearance of your home, but also prevents natural light from entering your rooms, transforming them in very dark and unwelcoming premises. And If you’ve already tried to clean and wash the windows by yourself, you know it’s time-consuming, tiresome and the final results are not the desired ones when you don’t have the necessary experience. Work with our local cleaners in Marietta. Benefit from advanced window cleaning equipment and the power of the distilled water. Accomplish sparkling glass surfaces with ease. Our technicians use water-fed extension poles to properly wash windows, sills and frames up to the fourth floor of a building from the safety of the ground level. This process can remove dust, dirt, fingerprints, water spots, smudges and even paint and plaster from any window around your house. Washing with distilled water cleans and polishes the glass surface, returning its initial gloss and making it nearly transparent. Why Choose Marietta Cleaning to Wash Your Windows?